The bag's interior is embellished with a pink, floral, vintage inspired pattern and has plenty of room provided by the large main compartment, a useful zipped pocket, an elasticated key hook, and a mobile phone pocket. With its unique aesthetic, add a touch of authenticity to your look. Approx. size: 43cm wide, 35cm high and 15cm deep. Note: Each bag is hand-finished and as a result colour and detail will vary from piece to piece. These Bags should be kept away from fire. Please be aware of colour transfer if rubbed against a lighter coloured fabric. Wipe clean with a damp cloth. 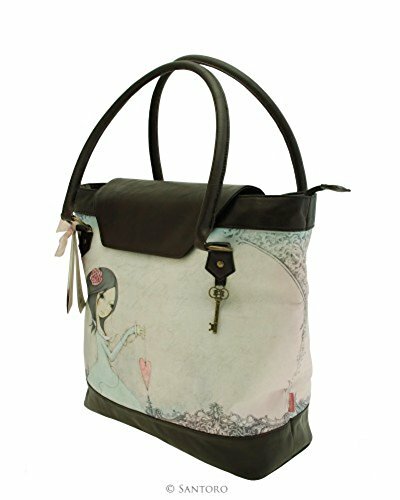 A large shoulder bag featuring the beautiful Mirabelle Augustine artwork, embedded in pastel green and grey tones. Approx. size: 43cm wide, 35cm high and 15cm deep. Each bag is hand-finished and as a result colour and detail will vary from piece to piece. If you have any questions about this product by Santoro, contact us by completing and submitting the form below. If you are looking for a specif part number, please include it with your message.